“Photo portrait of art historian Ellen Hulda Johnson, taken after her retirement from teaching at Oberlin College.” Wikipedia. Accessed May 6, 2016. Ellen Johnson was born in 1910 in Warren, Pennsylvania, to Swedish immigrants Jacob Augustus and Hulda Jeanette. Johnson entered Oberlin College as an undergraduate student and received her Bachelor of Arts in 1933 and her Masters of Arts in 1935, both in Art History. She did other post-graduate work at the Sorbonne in Paris (in 1935 and again in 1951), Uppsala University in Sweden (1946-7), the University of Stockholm (1946-7), and Harvard (Summer 1941). However, she did not receive a doctorate until Oberlin College gave her an honorary degree in 1981. In 1936, Johnson went to work at the Museum of Art in Toledo, Ohio, where she stayed until becoming the art librarian at Oberlin in 1939. During her time in Toledo, Johnson published her first piece, “In the Style of Praxiteles” for the Magazine of Art. While teaching, Johnson was also an active curator, collector, and writer, producing nearly a hundred articles and essays. Johnson lived in and preserved the Frank Lloyd Wright House in Oberlin, bequeathing it to AMAM after her death. Her personal collection of art contained more than three hundred pieces. Johnson was also a world traveler, making trips to New York, Paris, Scandinavia, and many more destinations, photographing throughout to enrich in her lectures and personal memoirs. Ellen Johnson retired from Oberlin in June 1977, and died on March 25, 1992, leaving the art world and Oberlin College in awe of her contributions. Alice Neel. Portrait of Ellen Johnson. Allen Art Museum. Accessed May 1, 2016. 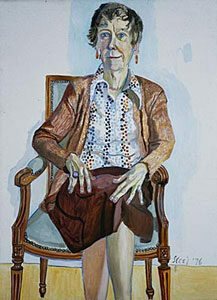 Alice Neel was a renowned contemporary American painter and feminist icon known for her portraits. Johnson served as a benefactor for women artists and historians—elevating and promoting the work of pioneering women using her position as a prominent contemporary American art scholar and curator. 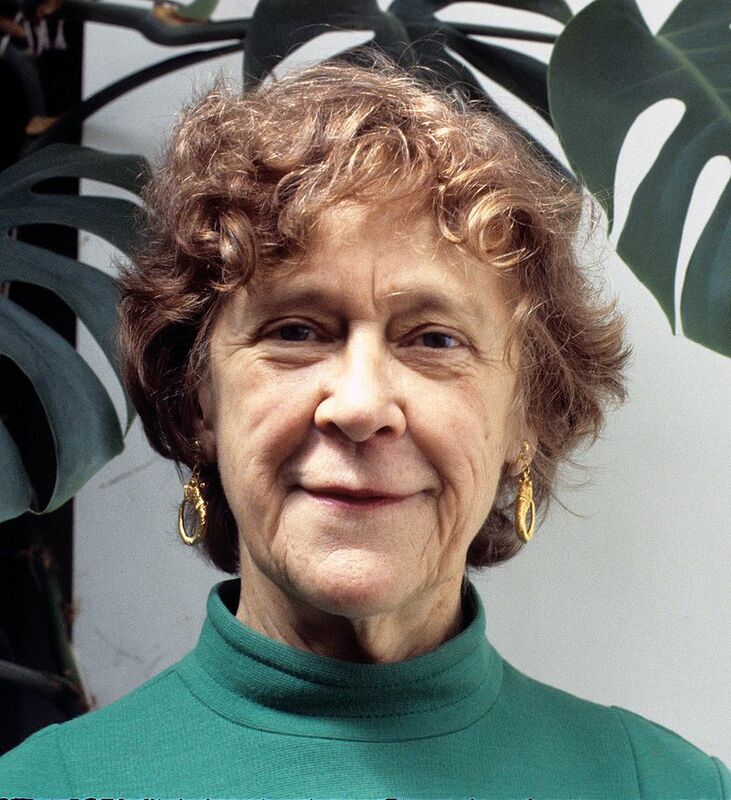 She maintained close relationships, both personal andprofessional, with women leaders of the art world, including Linda Nochlin, Athena Tacha, and Alice Neel. 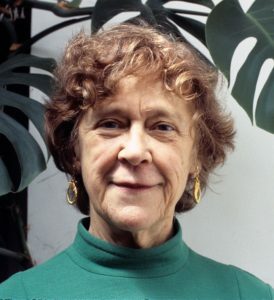 These connections translated into a lifetime of donations to AMAM, culminating in 1977 in the dedication to her of the Ellen Johnson Gallery of Contemporary and Modern Art. Her personal collection was exhibited at AMAM in May 1991 in a show titled The Living Object: The Art Collection of Ellen H. Johnson; she donated the collection to the museum at her death. 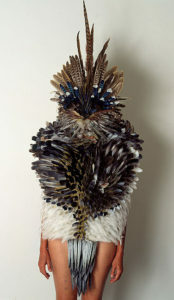 Johnson inspired many works of art, including Alice Neel’s Portrait of Ellen Johnson(1976), David Saunders’ Portrait of Ellen Johnson (1991), and Athena Tacha’s Feather Armour for Ellen (Head and Torso) (1992). Each of these pieces highlight a different aspect of Johnson’s character: her kindness, her imagination, and her strength. David Saunders, Ellen. 1991. Source Accessed 21 June 2016. Drawing upon documents from the Ellen Johnson Papers in the Oberlin College Archives, this mini-edition focuses on the period between 1972 and 1992. Each of the documents in this mini-edition display the relationships between Johnson’s ideas about feminism, art, and teaching at Oberlin. Document One is her response to the “Survey of Potential Faculty and Administrative Contributions to a Women’s Studies Program,” sent by Zara Wilkenfeld, Associate Dean of Students in 1972. In response, Johnson stated that she was unable to teach a course on Women’s Studies, despite her interest, because she was too busy. Johnson suggested several women artists who could come teach at Oberlin, and she was aware of the barriers faced by women artists and professors at Oberlin College. Document Two exemplifies Johnson’s commitment to accessibility. In an interview with Richard Spear, Johnson spoke about public art and outdoor sculpture as a way to deconstruct the elitism of art spaces. 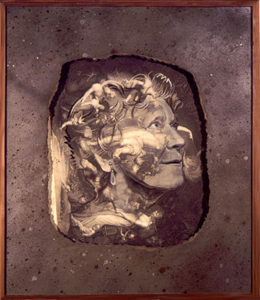 In her 1971 work “Why Have There Been No Great Women Artists,” Linda Nochlin asserts that many art spaces come from “the white Western male viewpoint, unconsciously accept[ing it] as the viewpoint of the art historian.” Johnson’s views closely resemble Nochlin’s, as Johnson was interested in increasing accessibility of art by uplifting women artists and their work. Later, Johnson arranged a Baldwin Seminar, an art history lecture series at Oberlin, for Nochlin March 1974, titled “Women and Art in the 19th and 20th Centuries.” Johnson and Nochlin formed a close relationship, with Nochlin writing “Ellen Johnson in Oberlin: Mainstream in Middle America” in 1975. In Document Three, a letter written to Johnson from Deborah Emont Scott, discusses about the success of the art rental program, which Johnson initiated and cared about deeply. The art rental program was and remains arguably one of the most accessible ways for students to experience and connect with art at Oberlin. Ellen Johnson, Fragments Recalled at Eighty: The Art Memoirs of Ellen H. Johnson, ed. Athena Tacha (Estate of Ellen Johnson, 1993), 87. A typical Oberlin class size is between twelve and forty students. The Frank Lloyd Wright house in Oberlin, also known as the Weltzheimer/Johnson House, is the first Usonian house in Ohio. It is located at 534 Morgan Street, on the west side of Oberlin. It was designed in 1947, and completed in 1949. The Weltzheimer family lived in it from 1949 to 1963. Johnson purchased the house in 1968, and worked extensively to remodel and preserve it (Frank Lloyd Wright House, Oberlin College, Source, accessed 27 June 2016). The program was established in 1972, and Hershiser’s courses were likely offered in the first year as well. “Women’s Studies Courses 1973-1974,” Curriculum and Advising, Women’s Studies Program, Subgroup I, Series VII, O. C. A.
 Linda Nochlin, “Why Have There Been No Great Women Artists?,” in Woman in Sexist Society: Studies in Power and Powerlessness (eds. Vivian Gornick and Barbara Moran; New York: Basic, 1971). Cynthia Elek, “Oberlin prints accompany Baldwin Seminar,” Oberlin Review 1 March 1973, Source, accessed 21 June 2016. The only information about this article is a quotation in a memorial to Johnson by Richard Spear, distinguished art historian at Oberlin College. He quotes Linda Nochlin, “In no other college has the positive interaction between new work, artists and audience been more deeply and consistently felt than at Oberlin in Ohio. And, as is so often the case, there is a moving spirit behind Oberlin’s role as an innovating, sympathetic setting for contemporary art: Ellen Johnson.” Nochlin wrote this piece for an “auction held that spring at Sotheby Parke Bernet’s in New York, a benefit to raise funds for Venturi’s new addition to the Allen Art Building” (Richard Spear, “MEMORIAL MINUTE: ELLEN HULDA JOHNSON, 1910-1992: Presented to the General Faculty of Oberlin College on September 9, 1992 by Richard E. Spear,” Genealogical File, Box #1, Record Group 30, Ellen Johnson Papers, Series I. Biographical Files, O. C. A.). An Open Letter to Ellen, Box #1, Record Group 30, Ellen Johnson Papers, Series I. Biographical Files, O. C. A.